Your goal is to fill in the squares with the numbers 1 to the width of the puzzle (4 in this case), where the number represents the height of the building on that square. There can’t be any repeats of numbers in a given row or column. For each number on the side, that’s the number of buildings you can see, looking down that row or column, in the direction of the arrow next to it. If there’s a bigger building (number) in front of a smaller building (number) (from the viewpoint of the number on the side), you can’t see the smaller building behind it. So if you were looking down a column that had [1, 2, 4, 3] in that order, you would see buildings 1, 2, 4, but the building with height 3 is hidden behind the one with height 4. So, you can always see at least 1 (e.g., if it were [4, 2, 1, 3]), and at most 4 ([1, 2, 3, 4]). You have to place the numbers such that all the “number of buildings seen” from each side panel are satisfied, as well as the constraint I mentioned above about the numbers in each row and column all being different. Note that for each “seen” number on a side, it’s *from that viewpoint*, looking up or to the left or whatever, just to be clear. So I wanted to solve this using techniques I’ve been learning. There are probably a few ways to go about it. 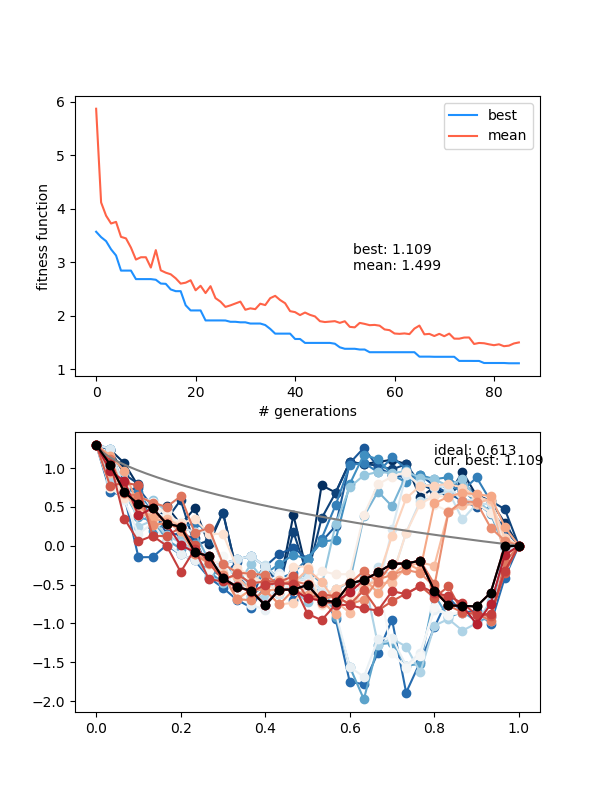 I actually tried both Genetic Algorithms and Simulated Annealing, with varying success, but I’ll save that for another post because I think they can do better that they are currently if I tweak them a bit. This immediately appeared to me as a Constraint Satisfaction Problem (CSP), like we did in our Coursera Discrete Optimization course, which I’ve made a few posts about in the past. CSP are basically where you set up a set of constraints that represent the problem, such that if you find a model that satisfies all of them, you’ve found the solutions. The actual algorithms you use to solve these CSP are some things we used in the DO course (like branch and bound), but in practice you probably use a CP solver that someone else has already written, because it will probably do something special like look at the structure of the problem to set it up in an optimal way. If you do this, then you simply get a CP solver and set up the variables and constraints, which can actually be tricky itself. There are many, many subtypes of CSP, and it’s an insanely important, dense field (that’s actually doing a lot of work behind the scenes that you might not know of). There’s actually a related (/subfield?) of CP called Integer Programming (IP), where all the variables are restricted to be integers, so I guess we’ll technically be doing that. To be honest, it wasn’t totally clear to me what the difference was, but this and this shed a little light on the distinctions. I think we’ll actually be doing CP now, because I use a few constraints like Min and Max, whereas IP only uses linear in/equalities. 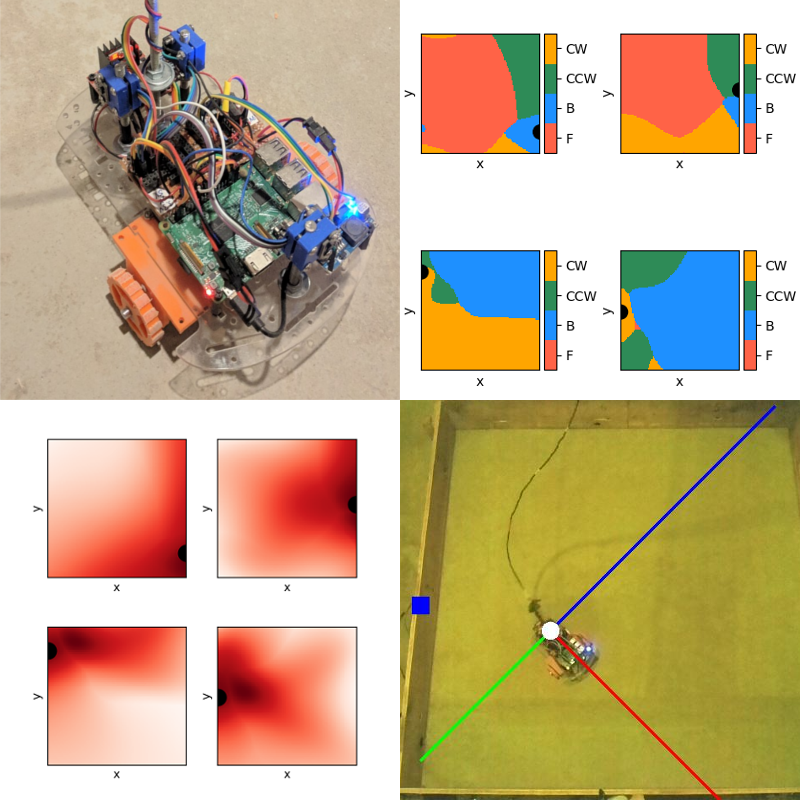 We actually used Gurobi for our course, mostly because Phil knew the most about CP solvers and suggested it. It was actually really straightforward and pleasant to use in python, and we used it to solve a Vehicle Routing Problem, which is basically the Traveling Salesman Problem on crack. My only qualm was that it seemed a little annoying to install, and it’s commercial, so you can either get a free license that limits the number of variables you can use, or get an academic license for free if you’re part of a school. I instead opted to use OR-Tools, Google’s Optimization Tools (it’s “operational research”). I did it partly because I was curious, partly because I usually like Google’s style, partly because I didn’t want to have to deal with the Gurobi license thing, and partly because it was super easily installed through pip3. Literally just “pip3 install ortools”. I was actually flying back home from Washington state on a plane that had surprisingly fast free wifi, so I downloaded it and was off to the races. solver.IntVar() creates an integer that’s bounded between 1 and size, inclusive, and you can give it a name. So we actually have a numpy array of these solver variable objects. Now we have to add the constraints! # All rows and columns must be different. Next, we have to add the constraints for see_list. This is the part, if any, that is a little tricky. It’s pretty easy to look at the puzzle and say “yeah, you can see 3 buildings looking down that row from the right”, but it’s not as immediately clear (to me anyway) how you would actually take the row of numbers and extract the number of ones you can see (and then set that equal to the number you’re supposed to see). The sidepair, left_top, and right_bot things are just indices to get the relevant element of see_list. The if statement is just making sure the value isn’t 0, i.e., there actually is a value we need to constrain (not a blank, like for the harder puzzles). The instrumental part is the last line. What it’s doing is the following. It’s basically starting at the first element in the row (from the left in this case), and then taking two subsets of elements of the row, in order from left to right. The first subset goes from indices [1,i] and the second subset goes from [1,i+1]. The first subset represents the buildings you can see counting just the ones from 1 to i, and the second is the buildings from 1 to i+1. It takes the max of each of these (note that because we’re adding a constraint, not just calculating it, we have to use the solver’s Max function, not the python one). The idea here is that, as you include the “next” building (the one in the i+1 position), if the max changes, that means you could see another building (so you have to add 1 to the building count) but if it doesn’t, the max was already in the range [1,i], so you don’t. So we want to iterate over i such that this process will cover every subset in the row, adding 1 to the building count each time the max increases. Because you just want a count of 1 even if the max changes by more than one (i.e., if adding the i+1 variable increased the max from 2 to 4), it seemed like I had to use something like the Heaviside step function, which I don’t think is in OR-tools, but I was able to figure out a sneaky workaround. If the next building doesn’t increase the max, then the difference between the maxes will be 0, which is what we want to add to the building count anyway. If the next building does increase the max, then their difference will be at least 1, if not more (but never negative, because it can only increase when we take into account more buildings). Therefore, we can take the Min (again, the solver version) of this difference and 1. Then, we take the Sum (the fancy solver version) of these Min’s, plus 1 (because you always see the fist building), and set that equal to the number of buildings we should see. Now that I look at it, you could actually just use the value at the i+1 index, not the subset, since that’s the only one that matters, but you’d still need to use the subset for the [1,i] range I think. I think you could also get rid of the whole subset thing by doing it in an explicit loop for each one, keeping an updated “max seen so far” variable, but I did this and it works. I won’t go over it, but you have to do the same for see_list from the right, but you have to reverse the subsets. You also then have to change the sidepair variable so it’s doing it on the top and bottom, and just slice the var matrix differently, but it’s the same idea. Now to actually solve it, we have to use a bit of ~~MaGicK!~~. We need a “collector”, which basically just collects the solution. We also need a “decision builder”, which we pass a few magic options. Then, we just hit Solve! I added the time limit because it seems like if you give it a broken puzzle (like, you enter a wrong number), it just hangs and ctrl+c won’t kill it, so you have to exit that terminal. However, the time limit doesn’t seem to work. Hmmm. I also made it print out all solutions it finds (though it’s usually just 1, unless you give it a really simple general puzzle). That was actually an ‘easy’ one though, not having any blanks. For the hardest one I can find, the 8×8 hard, it actually takes about 5 minutes of sitting there on my Asus Zenbook, but it gets it! 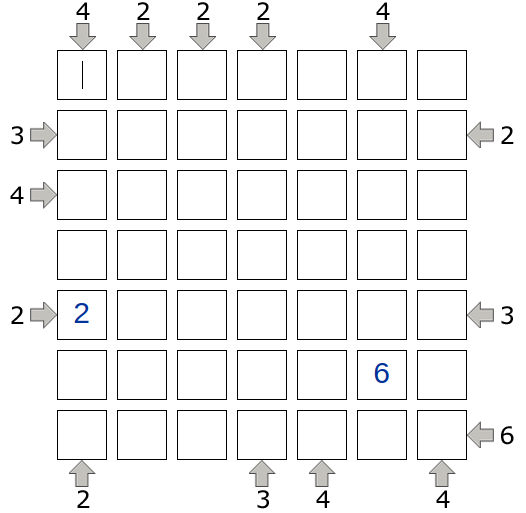 The website notes that larger puzzles are harder than smaller ones, such that the easy 8×8 is “far harder” than the hard 5×5, by the way. Welp, you get the point. I’m pretty sure it’ll slam anything that doesn’t have too many more blanks. I’ll probably make a post soon about my attempts on this puzzle through other, more handmade means, since this is honestly pretty black-box-y and feels a little like cheating (though it’s a very valuable tool!). I know only the very, very basics of what CP solvers are actually doing under the hood, so it’d be cool to solve it with something where I actually know how it functions. I’ve been doing this Coursera Discrete Optimization course with my friends. It’s a lot of fun and I’m learning a bunch. The instructor is a total goofball too, which is a plus. I’ve taken a handful of online courses before, but to be honest, the assignments have usually been pretty easy. Not so with this Discrete Optimization (DO (my initials!)) course! Each week, you have to solve 6 problems, and each is graded out of 10 depending on how well you do. I believe the breakdown is: 0/10 if your answer doesn’t even match the output format required, 3/10 if you do basically anything (even if your answer is quite wrong), 7/10 if you have an answer above some threshold but still not perfect, and 10/10 if your answer is optimal (I guess they know the optimal solution for all of them?). Usually, the problems increase in hardness throughout the set; often, the last one is difficult enough that (I believe we saw this said in the course forums by the instructor) it would be a challenge for people who specialize in DO for a living. I think that’s pretty cool! They usually give you a ton of practice problems of various difficulties, and (though I’m not 100% sure) I think the 6 you’re graded on are usually among those. So what is DO? I certainly didn’t know when I started this course, though I guess I should’ve been able to guess. Optimization is what it sounds like, finding the best solution you can for given problems. The “discrete” part is that the quantities involved are integers or discrete (that’s the name in the title!!!) components. It turns out I had actually heard of many of the problems that DO applies to before, but didn’t know they were DO. I had heard most of them in the context of P vs NP complexity. Anyway, enough of that. Week 1 didn’t have an assignment, so the first one was in week 2, and it was the famous “knapsack problem”. I’m guessing if you’re reading this (sike, no one reads this! ), you’re familiar with it, but in case you aren’t, it’s as follows. You have a knapsack with a certain (weight) capacity, K. There are a bunch of items in front of you, and each one has a certain weight (w) and value (v). You wanna fill your backpack with the most valuable (i.e., largest combined value) set of items you can, and you can only take the items whole (i.e., you can’t break one in half to fill the bag completely). Here’s where the “discrete-iness” comes into play. If you were allowed to take non-whole pieces of the items, the solution would be trivial: you would calculate the density (d = v/w) of each item, and start taking the most (densely) valuable items in decreasing order. When you get to the point where your bag can’t take the next whole item, you take as much of it as you can fit, and this is the theoretically most valuable set. The items already happen to be ordered by decreasing density. If you did the greedy solution and took item 0 (8, 4) and then item 1 (10, 5), you couldn’t take any more items and your total value would be 18. However, this isn’t OS! You can see that you actually wanna take the least two densest items, 2 and 3, which perfectly fill the bag and also add up to 19, the OS. The most naive way you can imagine is to try every possible set, and take the largest valid (i.e., all the items fit in the bag) solution. You have a list of n items, so for each one, you can either take it (1) or leave it (0). So there are really only (hah!) 2^n possible sets of items. Naturally, this lends itself to a tree data structure, but it should also be clear that 2^n quickly becomes infeasible for surprisingly low values of n.
Therefore, the real game is in traversing that tree in some clever way such that you don’t have to go through the whole tree. I should make a distinction here. There are two types of solution you can solve for. You can go for the OS, where you’re 100% sure the solution you end up with is optimal. This actually doesn’t necessitate going through the whole tree. Sometimes you can know that you don’t need to go farther down a tree, which allows you to not have to look at the solutions contained within that part of the tree, but still know that a solution you find will be the OS. On the other hand, sometimes this is still infeasible, so you have to go for an approximate solution (AS), where you’re just doing the best you can. However, not requiring the solution you get to be the OS can let you find great solutions way faster, and still sometimes even let you find the OS. The downside is that you won’t know 100% that you got the OS. So let’s actually start. The way my friends and I originally did it (and I stuck with), we actually don’t explicitly have a tree data structure; however, by dint of doing recursion with two possible recursive calls, this implicitly forms a tree. We need the function fullItemsStartingValue(), which finds the greedy solution. We’ll want this because we’re going to judge all solutions we find against the best (valid) one we’ve found yet, and this is a good starting point. 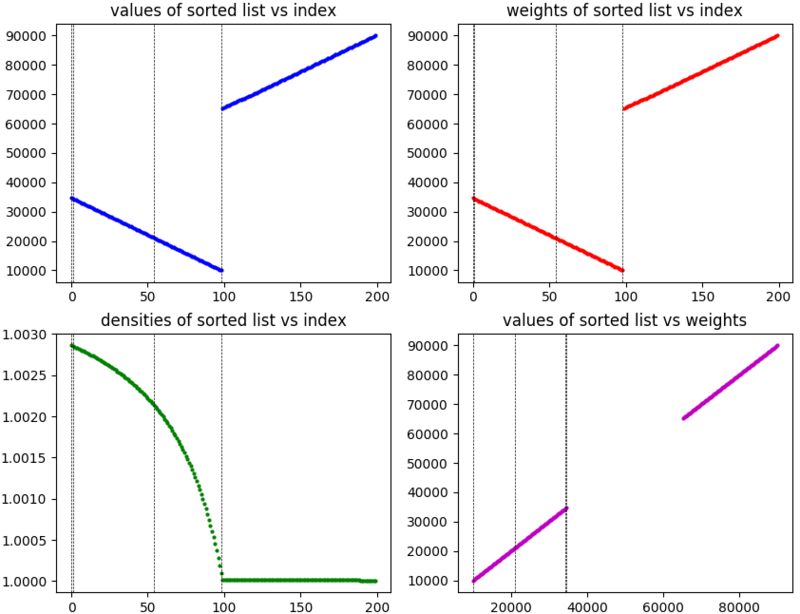 #This finds the greedy solution when the list is sorted by density. #If the value achieved by reaching this node is better than the best value found so far, update the best value and best set. #If we've gone through all decisions and are at the end of the tree. This is calling the function with itemIndex = 0 (so the first in the sorted list), the entire capacity remaining, no value accumulated (because we haven’t added anything yet), and an empty list of accepted items (same). Within the function, we’ll make “decisions” that call the function again, but with different arguments reflecting the “decision” that was made. Briefly, for a given call to this function (i.e., we’ve considered m items already, we’re going to call the function again to calculate the values found from accepting and rejecting the next item, and take the maximum of the result of those two function calls. This recursion continues until either we’ve considered all items, or an item doesn’t fit in the bag. The two global lines are there to access the global best set and value we’ve found, since we’ll want that info no matter where in the search we are. Next, we check to see if, for the current call to this function, its accumulated value is our best yet, and if it is, update that. Then, if the item index of the call is the end of the list, we know we’ve considered all the items, so we just return what we’ve accumulated so far. Then we set acceptVal = -1. -1 is the return value we use to indicate to the calling function that this branch doesn’t provide a feasible solution. So, we set acceptVal = -1, and then test to see if the bag has room to accept the next item in the list. If it can, it will recurse again and set that result to acceptVal (which could still end up being -1). However, if it can’t, we want acceptVal to stay -1 so it doesn’t affect the result of rejectVal, if that provides a solution. Then we do similar and recurse, but for rejecting the next item. Note that for calling the “accept” recursion, we had to add the next item to the accepted list and decrease the capacity by its weight, but for rejecting it we obviously don’t have to. Okay, so that’s the most naive solution! How does it do? To be consistent, I’ll just talk about how it did for the graded problems and how long it took. It solves problem 1, which has 30 items, in 16 ms, and gets 10/10 on it, but… hangs indefinitely on problem 2, which has 50 items. Clearly, we’re going to have to try a little more cleverness. As mentioned above, the name of the game in this field is somehow minimizing the amount of work you have to do, since you can’t possibly do all of it. A common way of doing this is to look at where you currently are in solving a given problem, and if you can see that continuing from this point won’t be fruitful, not continuing going down that path. Since this searching is (very often) in the form of a tree, implicitly or explicitly, it’s usually called “pruning” if you get to some point in the tree, evaluate what you can achieve, realize that no matter what it can’t be better than what you already have, and then stop going down that branch (and look elsewhere). The trick presented in the videos that we put to use here is something known as “linear relaxation”. The idea is this. As above, we want to figure out if we’re at a point where no matter what we do, we can’t get a better value than our best yet. But how do we figure this out, without actually evaluating everything? Well, assume we’re at some point where we’ve accepted some and reject other items, and have v1 value already in the bag and K1 capacity left. Then, since we’ve been adding items by decreasing density, we know that if we fractionally filled the bag with the densest items remaining, it would necessarily be better than or equal to the best possible solution from the point you’re at now. You’re relaxing (!!) the constraint that you normally have to take whole items, which should let you get the highest value possible for the items remaining. If that’s not going to get you a better value, nothing from that point will, especially since actual solutions do have to abide by that constraint. The “linear” in linear relaxation comes from the fact that you’re “linearly” filling the remainder of the bag. #This finds the best fractional value that the bag can hold. At this point, it now achieves 60/60 (10 for each problem)! Interestingly, despite the number of items increasing with problem number, problem 3 has 200 items and takes 30 seconds, whereas problems 5 and 6 have 1000 and 10000 items, and take 65 ms and 6.7 s, respectively. You can see from the plots that they definitely designed these problems to be wonky and have difference characteristics. To be honest, I’m still not 100% sure what the exact culprit here is that causes the 200 item problem to take so much longer than other (larger) ones. My best guess is that it has either something to do with the large gap in values (there are basically two clusters), or something about how it’s clearly designed to have one of those clusters (the one that contains the solution) have decreasing density, while having the other have pretty flat density. I’m guessing whatever it is makes the linear relaxation ineffective. Maybe I’ll come back to this at some point. The reason this works is that, remember, we’re trying to bound the possible result we can get, and then if that’s not as big as what we’ve already found a solution for, we prune. Therefore, if you overestimate the possible achievable value, the worst that happens is that you don’t prune as aggressively at that point (for example, some of the time, this “extra” linear relaxed value will actually be above the best value you’ve found, so it won’t prune it, but if you had calculated the traditional linear relax. value, that would have been below the best value and it would have pruned it). So it will still be an OS. So, which wins out? Is not having to do that O(n) operation every recursion worth the cost of less aggressive pruning? You can see that it outperforms it by about half for most of them, except for the 10,000 problem, where it really slams it (it also gets 60/60 of course). One other thing that I should probably briefly mention is another tree traversal method called “Least Discrepancy Search”. My friends and I still debate over one aspect of it, so what I’m going to say here should be taken with a grain of salt. LDS is similar to DFS, except the idea is that you have something called the heuristic (we’ll see more of that in future posts! ), which is kind of a “goal”. It’s in general what you want to be aiming for. So, for this problem, it seemed natural to want to always take the densest item you can. So, in LDS, you search the tree by doing a DFS, but keeping track of the number of discrepancies (not accepting an item) from the heuristic (i.e., taking every item) you’ve used in that search. You do this DFS search in order of increasing allowed discrepancies, starting with 0 (take every item), then 1 (take every item except for one item), etc. The part we’re debating about is what exactly counts as a discrepancy from the heuristic. For example, the way we do DFS, you do the “accept” recursion if you can (have space), and do the reject one either way. However, when doing LDS, should it count as a discrepancy if you reject the current item because you don’t have space for it? It seems like you were “forced” to, so in a way it wouldn’t make sense. It seems like discrepancies should be accounting for the number of choices you make that you can do but “don’t make sense” according to your heuristic. That said, every tutorial I could find had the search tree organized with “accept” as the left branch and “reject” as the right, and said that the number of discrepancies is the number of right turns you take, so I implemented it that way. The results were…not impressive. It did about as good (time-wise) as plain DFS on a few problems, but much worse on others. I was kind of hoping that due to how it traverses the tree, it would at least do better on one problem (maybe that peculiar 200), but not really. It’s possible I did it wrong, of course. If you know for sure, please let me know!